Tooth loss is the most serious dental problem, and one that can have a significant impact on the overall health and function of the smile. Fortunately, there are many restorative dentistry treatments that address tooth loss. However, none of these treatments comes close to matching the comfort, strength, or durability of dental implants. Dental implants fuse with the patient’s jawbone and act as an anchor for a full range of dental restorations. Because dental implants are placed in the jawbone, they act as artificial tooth roots and function very much like the natural teeth. Each implant is made of three parts that contribute to the strength and success of these restorations. Drs. Gerald Bird and Jay Johnson are happy to discuss the anatomy of a dental implant with their Melbourne, FL patients to give them a better understanding of this advanced tooth loss treatment. The foundation of a dental implant is the implant post. The implant post is a small threaded piece of titanium that looks just like a tiny screw. The implant post is the piece that is implanted directly into the gums and jawbone during the initial dental implant surgery. In the weeks following the placement of the implant post, the jaw bone will heal around the screw so that it gradually fuses with the jaw’s natural tissues. This process, which is known as osseointegration, is key to the long-term success of dental implant treatment. Aside from providing valuable support to the final dental restoration that is placed on the implant, the implant post also plays the important role of acting as an artificial tooth root. The implant post absorbs the force of a bite and stimulates the jawbone to regenerate tissues. 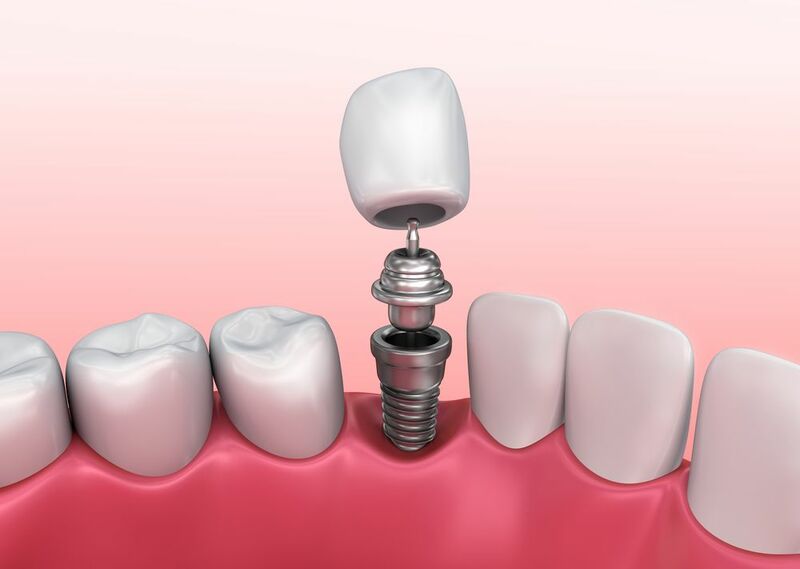 A dental implant abutment is a small metal post that sits atop the implant post. The abutment is not placed during the initial implant surgery. Instead, this piece will be secured to the implant post during a secondary procedure that is scheduled after the mouth has healed and the post has fused with the jawbone. To place the abutment, a small incision is made in the gum line. The abutment is connected to the top of the implant post and left to protrude from the gum line. After the gum tissues have healed around the abutment, this small post will be used to secure a dental restoration to the implant post. The final piece of a dental implant is the dental restoration. The restoration is the piece that is used to actually replicate the crown of the missing tooth. A dental implant can support a full range of dental restorations, including a dental crown, dental bridge, or dentures. The restoration that is suitable for each patient will be attached to the abutment of the implant so that it can be supported by the implant post. If the restoration of a dental implant ever wears down or becomes damaged, it can be replaced without having to do anything to the implant post or abutment. Whether you have lost a single tooth or an entire arch of teeth, you may benefit from the strength and support of dental implants. Contact us to learn more about this advanced restorative dentistry treatment, and find out if you are an ideal candidate for this procedure.